Colorado Votes To Abolish Slavery, 2 Years After Similar Amendment Failed Colorado voters have approved an amendment to their state's constitution that completely abolishes slavery — by stripping away language that still exists in the U.S. Constitution's 13th Amendment. Article II, Section 26 of Colorado's Constitution has closely mirrored the U.S. Constitution's 13th Amendment, which states in part: "Neither slavery nor involuntary servitude, except as a punishment for crime ... shall exist in the United States ..."
Colorado voters have approved an amendment to their state's constitution that completely abolishes slavery — by stripping out language that still exists in the 13th Amendment to the U.S. Constitution, which bans slavery and servitude "except as a punishment." Amendment A answered the question: "Shall there be an amendment to the Colorado constitution that prohibits slavery and involuntary servitude as punishment for a crime and thereby prohibits slavery and involuntary servitude in all circumstances?" The amendment was put on the ballot with overwhelming bipartisan support from Colorado's lawmakers. It will change Article II, Section 26 of the state's constitution, which has stated for more than 100 years: "Slavery prohibited. There shall never be in this state either slavery or involuntary servitude, except as a punishment for crime, whereof the party shall have been duly convicted." The new version will shorten that second sentence to say, "There shall never be in this state either slavery or involuntary servitude." 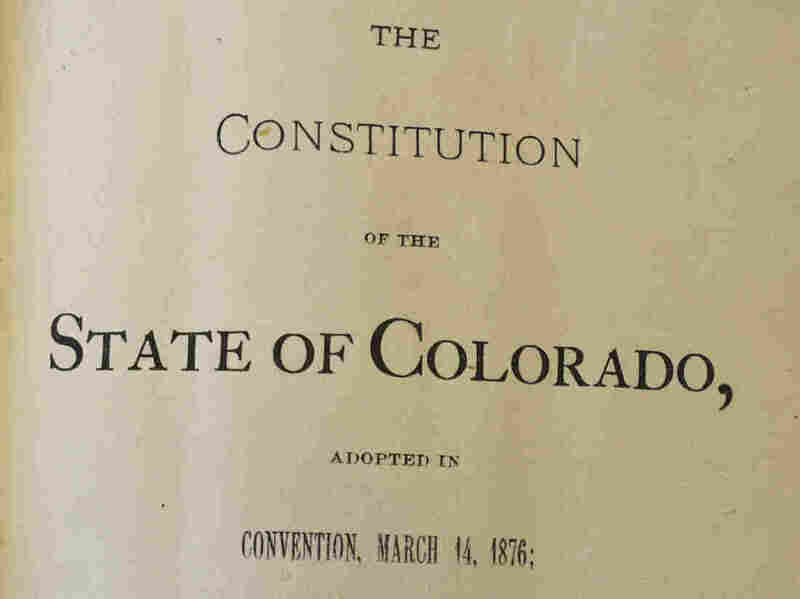 "Proponents, including Abolish Slavery Colorado, argue that the state constitution should be updated because it represents a time when not all people were seen as human beings or treated with dignity. Opponents say the change could result in legal uncertainty around current prisoner work practices in the state." Tuesday's vote showed 65 percent in favor of the amendment, with 35 percent opposed, according to the Colorado secretary of state's election tally at 12 p.m. ET Wednesday. The result was well clear of the 55 percent required to pass an amendment. Colorado's original language closely mirrored the 13th Amendment to the U.S. Constitution. As ratified in 1865, that amendment states: "Neither slavery nor involuntary servitude, except as a punishment for crime whereof the party shall have been duly convicted, shall exist within the United States, or any place subject to their jurisdiction." This was the second time Colorado voters have considered the issue. A similar measure was offered in 2016, but the language on that year's ballot was deemed too convoluted. Some voters said they weren't sure whether a "yes" or "no" vote meant they were for or against striking the exception clause. Critics of the amendment have also said it "could interfere with prison labor for things like fighting wildfires," as member station KUNC reported. The measure's backers say such programs wouldn't be affected because inmates voluntarily agree to take part. "After the Civil War, many states, mostly former slave states, immediately exploited the 13th Amendment loophole allowing slavery and involuntary servitude as a punishment for crime. Many former slaves were arrested and then put back into slave labor conditions through convict leasing, a lucrative practice that generated more than 70 percent of total state revenues for the state of Alabama in 1898. From the 1920s through 1941, convict leasing was gradually eliminated through state laws and by presidential executive order. The constitutional loophole, however, was never removed." Constitutional law scholar Richard B. Collins, a professor at the University of Colorado-Boulder's law school, offers a different reading, calling it specious to say that the original state amendment endorsed slavery. "Colorado's provision is a virtual copy of the 13th Amendment," Collins said in an email to NPR, "and there is no reason to think that those who adopted our state constitution intended anything different from the federal original." Noting lawmakers who pushed for the 13th Amendment, Collins says, "The heroes of the abolition movement did it: Lincoln, Thaddeus Stevens, Benjamin Wade, John Bingham. Is it plausible that they intended to allow slavery in prisons?" In terms of the potential legal impact of Amendment A, Collins said, "Of course prisoners' lawsuits will invoke this measure to advance claims against our prisons." The question now, he added, is "what will our courts do with that?"